I just learned about the specifics of WWII food rationing in Britain. I knew they used ration books and coupons, and that it wasn’t very fun. But I learned they still ate more much meat, sugar, fats, and oils than I do today. The ration allowed for 230g/week of fats and oils (margarine, butter, lard), 230g/week of sugar, and about 500g/week of meat and cheese. They also allowed 800 ml/week of milk, and 500g/week of jam. Vegetables weren’t rationed. Geez, that’s a lot. I don’t even eat half of that. I doubt I eat 100g of sugar/week. I eat less than 200g/week of meat. I doubt I use 100g/week fats and oils. I avoid all dairy, and don’t eat jam. Of course, I eat an amazing variety of fresh produce, unobtainable in wartime Britian. 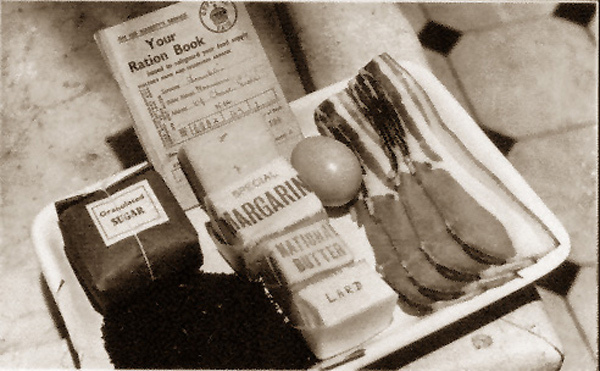 Anyways, people have suggested that WWII rations-based diets would improve the public’s health. This should be fairly obvious. In fact, a woman has lost 10 stone on a 1940’s diet experiment, using vintage recipes. The photo of a week’s rations (above) might look like deprivation to some. But to a McDougall’er, it looks like gluttony and health issues.